Manuel Dunham is a 28-year old welterweight boxer based in Seattle, WA. He has been fighting in the sport for over 16 years, but in the last 18 months he has spent more time fighting with promotional contracts and managerial logistics than fighting in the ring. Dunham is on that difficult quest of landing his first professional fight. There is a certain formula to crafting a successful fighting career. Aside from developing the necessary skills inside the gym, outside of it is a tango of legal contracts, promotional assessments, and garnering of public interest. The fight game works very much like the stock market with the fighters as the shares, promoters as the investors, and the debut fight as the initial public offering. How much time and effort a promoter is willing to give at getting their charge the ideal first-fight conditions is reflective of how much return an investor believes he will earn on the deal over time. Setting a fighter up with the correct string of opening matches increases the likelihood of a mega-fight somewhere down the road and accomplishing that requires ensuring an unblemished record through a careful choice of opposition. Somewhere in all of that is an actual contention to finding the best fighter in a particular weight class. Dunham believes he can be the best in his. There are, however, a few factors working against Dunham. The first is his age. Teammates help adjust headgear for Dunham before he steps into a sparring session. Fighters are said to be at or soon-to-be arriving at the peak of their career abilities at 28, and Dunham hasn’t even started his. There are of course exceptions to the rule. Antonio Tarver started his career at Dunham’s age and Bernard Hopkins, despite his recent loss in the ring, competed at the pinnacle of the sport a few months before his 50th birthday. Dunham holds these two examples in high regard and relies on his elusive fighting style to allay the concerns of time. Dunham adds with a stern determination that he will continue chasing his dream until his retirement age, but it is uncertain how many promoters would be willing to take a chance on a debut fighter with a 7-9 year shelf life. Then there’s the issue of where he lives. Dunham during a sparring match. 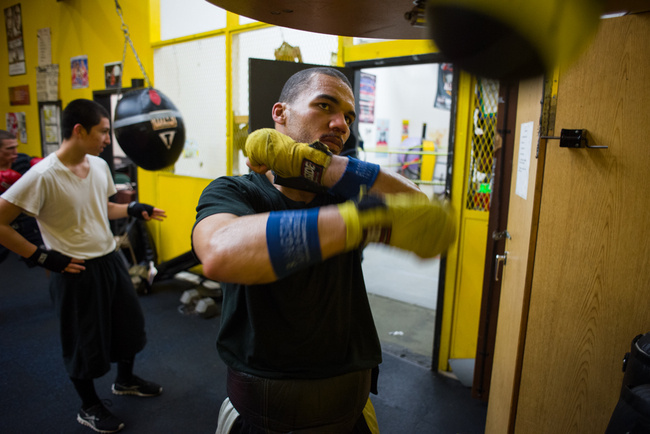 Dunham hails from Seattle, a city not particularly known for its boxing pedigree, and its lack of presence in the boxing world has consequences on its fighters. Building a recognized name starts from a local fan base and ripples out towards the rest of the country, but since Seattle lacks that foundational fan base, much of its talent gets overlooked when promoters scout the nation for their next champion. Dunham has managed to build a name for himself despite his geographical constraints, specifically a regional Golden Gloves championship and a current number six ranking by USA Boxing in the light welterweight division, yet these accolades combined with the other factors working against him may have strangely enough acted more as a deterrent to his career than a supplement. 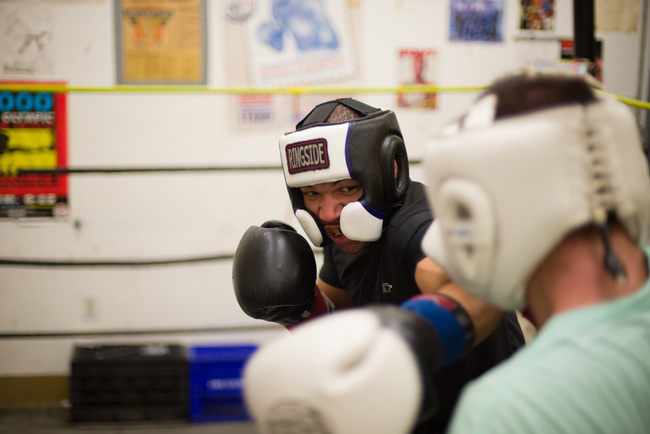 Boxing is sold on stories, the mythologies that get passed around the water cooler that convince viewers to tune-in. For first-time fighters, this is usually achieved by an Olympic background or garnering a surname of lineal consequence. Otherwise, momentum is built from the hometown fans and local lore. Without it, breaking through is difficult, and Dunham oddly finds himself in the middle of dangerous territory. His name is known, but maybe not known enough; his decorated amateur career impressive, but perhaps not impressive enough to get onto the other side. What remains are up-and-coming fighters hesitant to take a fight against him and promoters unwilling to take a chance on him. Dunham shadowboxing at the Bumblebee Boxing Club. Dunham has gotten a few offers, but none of them have been ideal. Most of them are tied to multi-year promotional contracts that would bind the fighter to certain cards, which at the moment only happen once every two months, about half the frequency Dunham would like to be in the ring. The only other potential offer came from Fabian Maidana, younger brother to the famed Argentine that squared off against Floyd Mayweather last September. The younger Maidana holds an unblemished 5-0 record with an 80% KO ratio, not exactly the ideal situation to be walking into as a debut fight. But even under such daunting odds, Dunham’s polished amateur career raised caution in the Madiana camp as negotiations began to waver once they researched his background. When dissected further, Maidana’s perfect record is built mostly upon opposition with severe losing records. The offer fell off the table after the first few weeks. Dunham working the speed bag to finish out his training session. Dunham has a clean-cut appearance and a lifestyle to match. 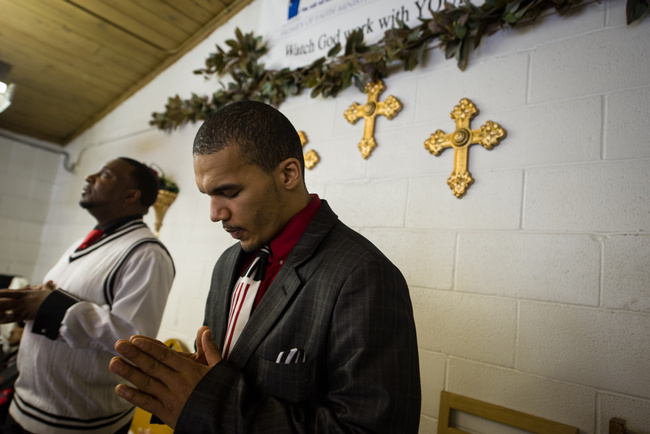 On Sundays he preaches to a local church congregation and has a general concern for the well being of others. He carries himself with a demeanor of fairness, believing in treating others justly, and that what one earns is in direct proportion to what one gives. Because of this, he doesn’t believe in handouts, in life or in the ring. “For me, there’s no ideal opponent, just someone who comes to fight, who makes it a fight. I don’t want just someone laying out for me; I don’t get nothing out of that. You only get something out of it when there’s a challenge,” says Dunham. While the desire to be challenged is noble, the prospects of defeat do need to be taken into consideration. Dunham is well aware of the risks of being poorly matched, and avoiding that pitfall has made the search all the more difficult. Dunham changing into his gear before a training session. He often packs his work attire to training as he leaves to work directly afterwards. Dunham has worked a number of jobs from airport cargo loading to overnight security guard positions, in order to supplement his boxing career. 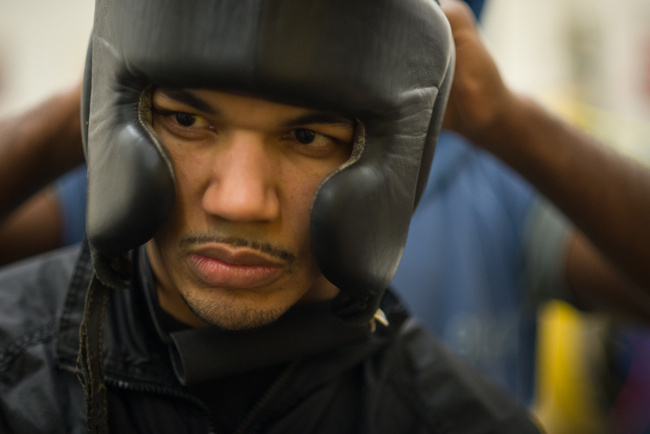 In the boxing world, losses matter, a debut loss even more so. It could derail a career before it even gets started, ruining both a fighter’s self-esteem and marketability. You will often hear fans of the sweet science scoff at a boxer’s legitimacy simply because there is a positive integer in the loss column, and the beginning stages of a career often determine what role a boxer plays in the industry. Perhaps the worst is to be fated as the dreaded “stepping-stone” or “opponent” role, a story that hits close to home for the Seattle pugilist. Dunham comes from a fighting family. In a tribe of seven, everyone fought, including the family matriarch. While never stepping into the ring as a competitor, the mother did spend a good three or four years in and out of the gym “leaning how to throw hands”, and according to Dunham, the ritual helped her manage the obstacles of being a single-parent. Out of the seven, his older brother John eventually made it to the professional ranks, though the route of his career spelled more caution than inspiration for Dunham. 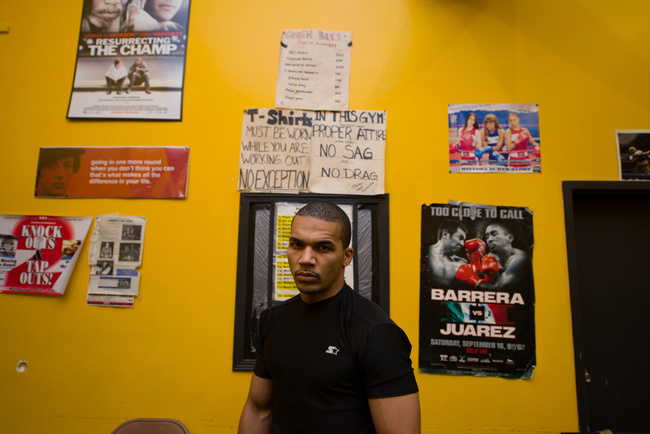 Seattle based amateur boxer Emanuel Dunham posing at his home gym in Seattle, WA. The older brother holds a record of 1-10 with 9 of those losses coming by way of KO. He books fights with relative ease as a guaranteed win for the opposition, but his frequency of competition has dropped considerably in recent times since losing records only go so far, even for promoters only looking to pad a record. It can be assumed by the ratio of KO losses that the physical punishment John Dunham has taken is considerable, and more than likely the pay isn’t high, as that echelon of fighter rarely is. It is a cautionary tale for the younger Dunham brother, and though caution is hard to afford in his position, he presses on, despite the obstacles. Dunham plans to get married this coming May, with further plans on building onto his current family. 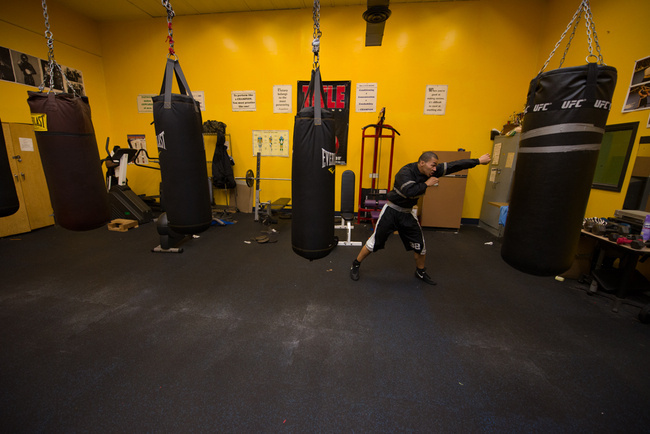 Earning a stable livelihood is becoming more imminent than ever, but due to the demands of training and the sporadic nature of the boxing world, he’s been restricted to taking odd jobs with odd schedules in order to be ready to go anytime, anywhere for a fight. He’s worked at almost any place imaginable: airports, department stores, and his more current employment as a night-watch for a security company. Given his work ethic and attitude, he could easily be earning a more livable wage in other pursuits. Essentially, he’s given up the prospects of a stable working career to take a chance on fighting. 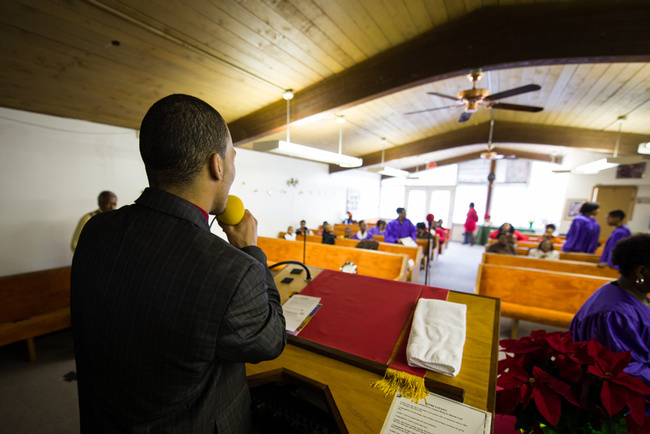 Dunham giving the closing prayers during a Sunday church service. Boxing can be a cruel sport. There are plenty of physical consequences inside the ring, from irreparable nerve damage to slurred speech, and in the worst cases, death. Outside the ring are those who picked up drug habits, squandered their earnings and ended up in a sore position in life. The unknown are the ones that never started, and in some ways perhaps the most haunting of them all. For now, Dunham is doing his best to avoid falling into the third category, and ensuring that all the time and effort in the gym doesn’t go to waste.